RAPAPORT... 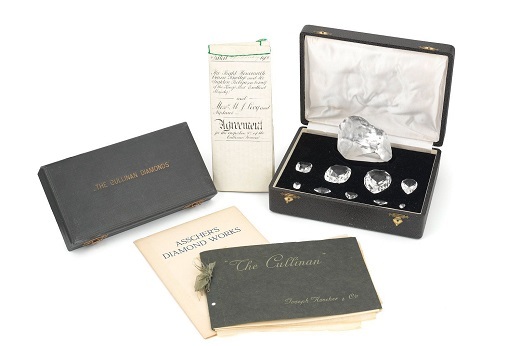 The original manuscript that brokered the cutting of the 3,106-carat Cullinan diamond to create the Crown Jewels of Great Britain is going under the hammer at Bonhams. The sale includes the documents the representatives of King Edward VII and London diamond brokers M.J. Levy & Nephews signed in January 1908. A paste replica of the Cullinan diamond in its original rough form, as well as two replica sets of the nine principal diamonds that form the Crown Jewels, will also be up for auction at the April 30 sale in London. The entire lot has a presale estimate of GBP 2,000 to GBP 3,000 ($2,600 to $3,900). The original rough stone, discovered at South Africa’s Cullinan mine, initially failed to find a buyer. It was eventually sold in 1907 to the South Africa Transvaal Colony government for GBP 150,000, and later presented to King Edward VII on his 66th birthday. The Asscher Company cut the diamond in 1908, fashioning it into nine main diamonds and more than 96 smaller ones. The principal stones — named Cullinan I through Cullinan IX — form part of the collection of the royal jewels. The largest diamond, Cullinan I, weighs 530.20 carats and sits at the top of the Sovereign’s Sceptre. It can also be removed and worn as a brooch, paired with the 317.40-carat Cullinan II, which is set at the front of the Imperial State Crown. Other notable items for sale at the Bonhams auction include a cushion-cut, 17.43-carat Kashmir sapphire ring with diamonds, valued at $390,000 to $520,000, and a step-cut, 9.07-carat diamond ring with an estimate of $330,000 to $460,000.